Over time, the lens of a peephole can become scratched, dirty or cracked. Any damage to the peephole lens reduces your visibility of anyone knocking on your door. 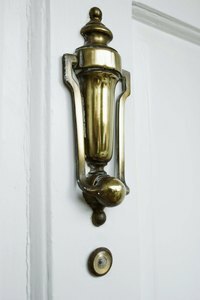 Incorrectly performing a peephole replacement could result in damage to the door. Excessive damage to the area surrounding the peephole mounting location could require replacing the door rather than replacing just the peephole. Open the door. Hold the peephole lens – located on the outside of the door – with one hand. Look at the end of the side of the peephole sitting on the inside of the door. Locate the two slots sitting on the inside of the peephole flange. Set the tip of a flathead screwdriver on the slot located on the left side of the flange. Push the tip of the screwdriver toward the ground. Stop pushing when the flange moves counterclockwise. Turn the loosened flange counterclockwise by hand until it pulls from the door. Pull the lens section of the peephole out of the front of the door. Discard both removed pieces. Disassemble a replacement peephole using the method described for peephole removal. Push the lens section of the new peephole into the side of the hole located on the outside of the door. Enlarge the hole with a drill bit – secured in a drill -- if it fits tightly in the hole. Push the flanged section of the replacement peephole into the side of the hole located inside the door. Turn the flange section clockwise to tighten it to the lens. Stop turning when the peephole sits securely in the door.